>Teton is simply not interested in toys anymore. I’ll take that back. He is interested in brand new toys. For about 45 seconds. And that might only be because I carry it around with me throughout the house for a good 2 – 3 minutes gooing and gaaing over it as if I’d just killed the evening meal with my bare hands. So, I admit that this toy review is on a (gasp) previously purchased item. You don’t want me to go broke, do you? 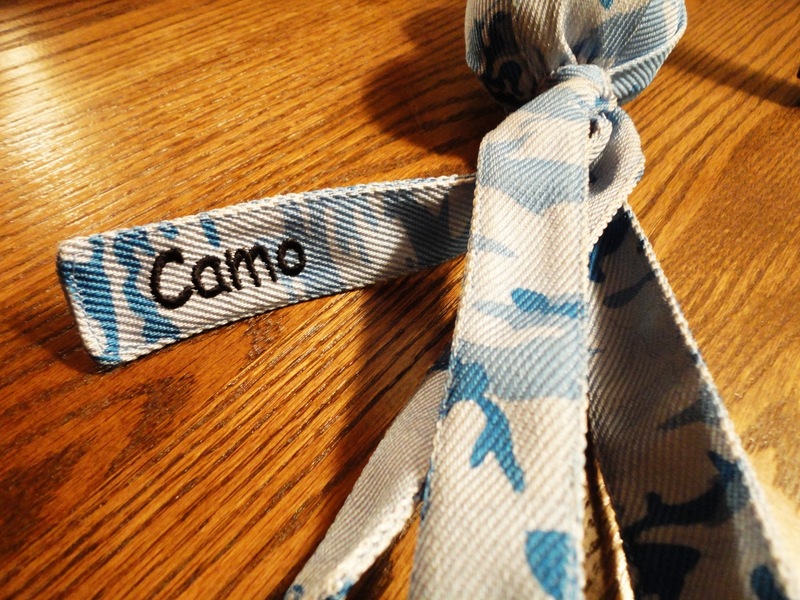 Please note that TLB’s Wubba was purchased in the Camo color, which is clearly more masculine. 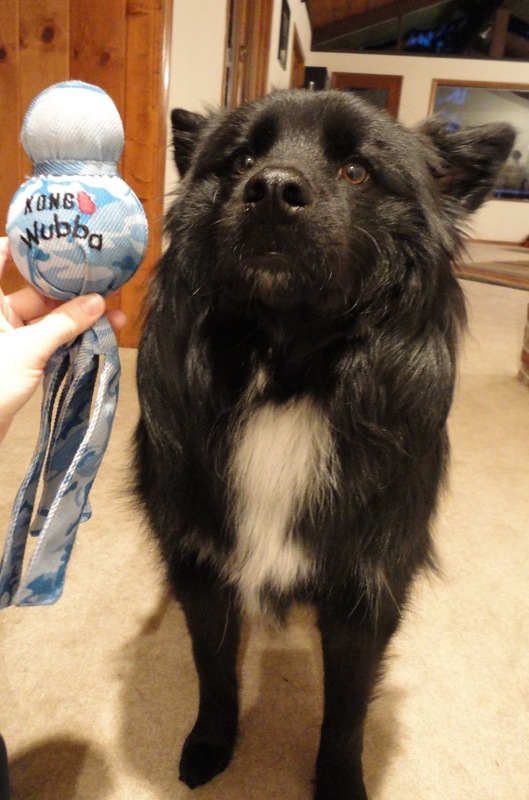 The Kong Wubba is made of very tough nylon. Pick one up in the store and you’ll know immediately that (for most dogs) it’s a durable toy. The top of the Wubba is a tennis ball and the middle is a rubber ball with a nice, loud squeaker. Then, of course, we’ve got the “tail,” which is made of wide strips of nylon. The Wubba tail is particularly fun for dogs who like to shake their “kill” around. My friend’s dog shakes this puppy around like there’s no tomorrow. I’m surprised she hasn’t knocked herself out with it yet. Go, Tatum! The KW is a great all-around toy. 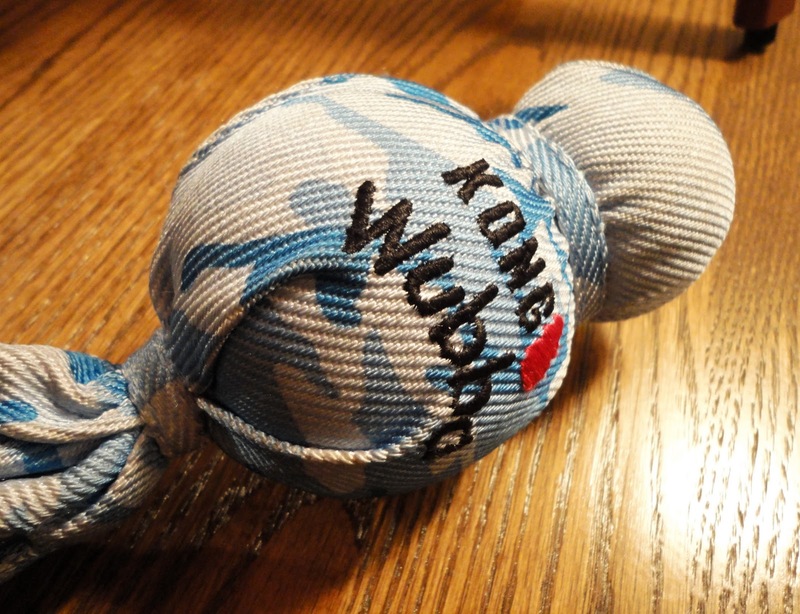 Your dog’s wait staff (that’s you, my friends) can easily launch the KW a good 8+ feet by grabbing the tail (the Wubba’s, not your dog’s) and giving it a hearty chuck. But, if you don’t have a fetcher, never fear, because the KW is strong enough to withstand some chewing. TLB either plays fetch with me (this only lasts a maximum of four minutes), plays fetch with himself (throws the ball into the air and runs after it = hilarious), or just chomps on the KW for a while. 1. Price – Around $10. Very reasonable for a durable toy. 2. Quality – Made from strong nylon. TLB hasn’t chewed the Wubba to bits, but I have seen some that have seen better days. It all depends on your dog’s chewing tendencies. 3. Benefits – Multi-faceted toy. Good for fetch, self-play, and light chewing. 4. Ingredients/Features – Strong, durable nylon. Rubber ball with squeaker and tennis ball. Some worry about the fuzzy green stuff on tennis balls harming your dog’s teeth, but as long as the Wubba nylon isn’t chewed through, this shouldn’t be a problem. 5. 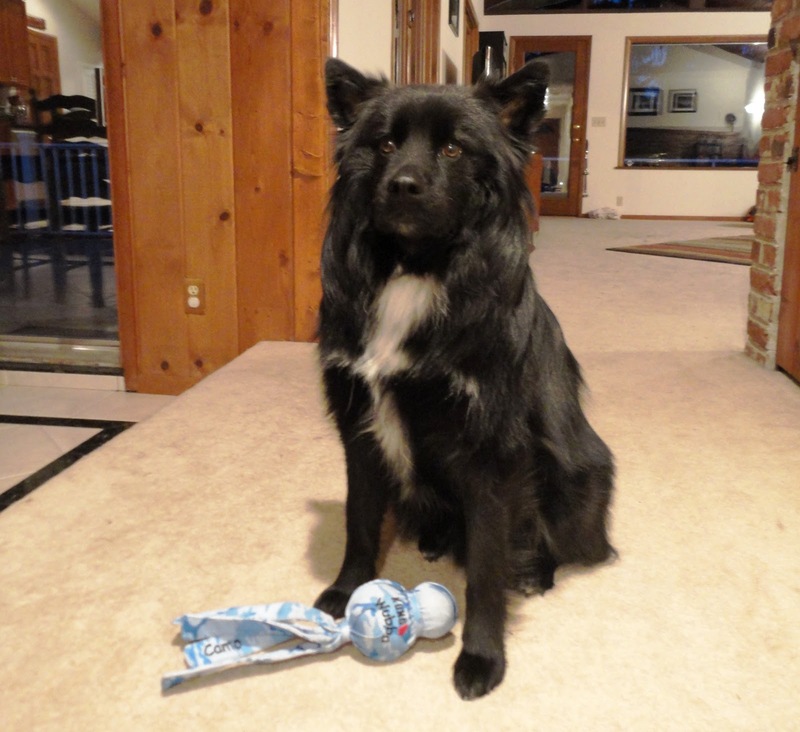 T-Factor – Teton liked his Wubba the day that he got it. But then the novelty wore off. It’s an okay fetching toy, but not his favorite. 6. Uniqueness/Fun – The design of the KW is great! A good, classic tennis ball, a fun, squeaky rubber ball, and a bunch of long nylon strips to fling around. TLB isn’t really a toy kinda guy. 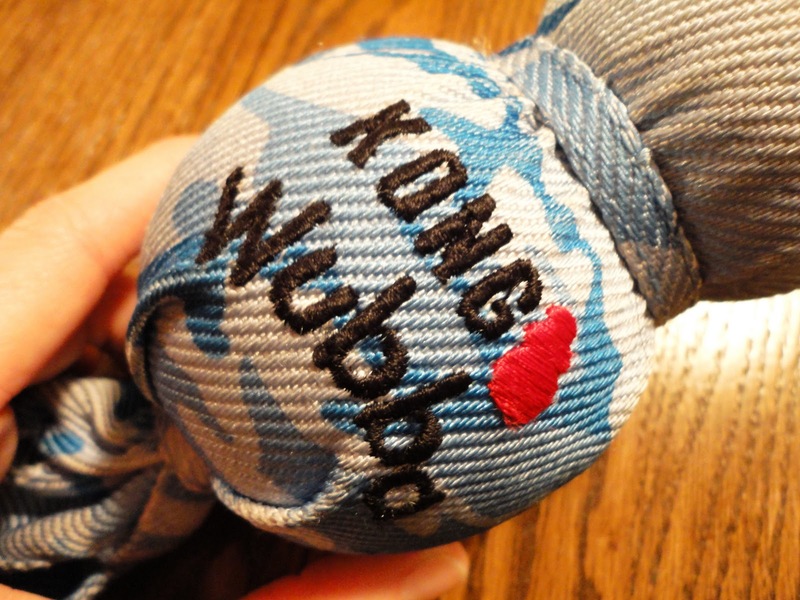 However, we’re going to rate the Kong Wubba for all of our other furry friends and their wait staff. The Wubba gets a seven out of 10. Good price, strong material, and fun! Posted on February 17, 2011 May 14, 2011 by Shannon	This entry was posted in Toy Chest. Bookmark the permalink.